After Katrina: Rebuilding Lives and Infrastructure, (MDOT: Jackson, Mississippi-2007). Artists of the Gulf Coast-A Commemorative Coloring Book, (MDOT: Jackson, Mississippi-2007). Biloxi Bay Bridge-Ribbon Tying Ceremony, (MDOT: Jackson, Mississippi-2007). Mississippi Renewal Forum, Summary Report, (The Town Paper: Gaithersburg, Maryland-2005). The Bay Press, “On building bridges [guest editorial by Biloxi Mayor A.J. Holloway]”, February 3, 2006, p. 1. The Bay Press, “MDOT inspects drawbridge”, April 28, 2006, p. 3. The Bay Press, “Bridge viewers restricted to certain areas”, September 1, 2006, p. 15. 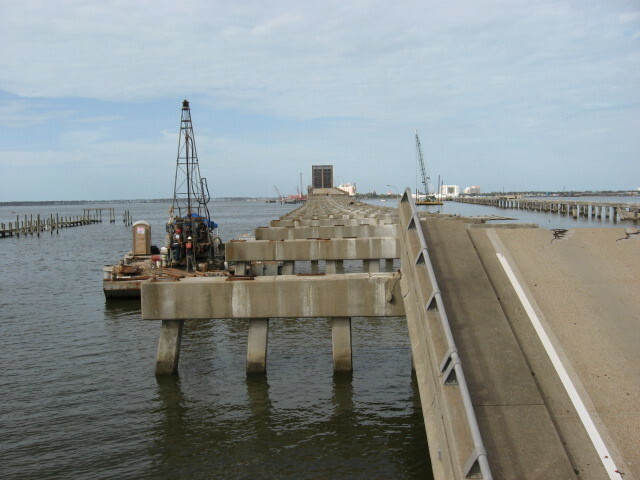 The Bay Press, “Biloxi-Ocean Springs bridge on schedule”, August 24, 2007, p. 1. The Bay Press, “New bridge to feature local artwork”, August 24, 2007, p. 3. The Bay Press, “Bridging the Gap”, Commemorative Section, October 25, 2007. The Mississippi Press, “OS/Biloxi bridge project hits visible milestone”, December 19, 2006. The Mississippi Press, “Celebration”, October 30, 2007, p. 1-A. The Ocean Springs Record, "Bridge replacement process moves along", October 6, 2005, p. A1. The Ocean Springs Record, "Aldermen weigh second MDOT bridge plan", October 13, 2005, p. A1. The Ocean Springs Record, "Ferry still on city wish list pending bridge", November 3, 2005, p. A7. The Ocean Springs Record, "Moran: Ocean Springs MDOT must unite", November 3, 2005, p. A4. The Ocean Springs Record, "City OK may clear way for bridge", November 10, 2005, p. A1. The Ocean Springs Record, "MDOT not listening to Ocean Springs bridge issues, Mayor says", November 10, 2005, p. A1. The Ocean Springs Record, "Group questions bridge", November 17, 2005, p. A1. The Ocean Springs Record, "MDOT money woes cause bridge delay", December 1, 2005, p. A1. The Ocean Springs Record, "Brown defends MDOT's six-lane plans", December 8, 2005, p. A1. The Ocean Springs Record, "Bridge battles", January 5, 2006, p. A1. The Ocean Springs Record, "Studies of MDOT data take issue with six lanes", January 5, 2006, p. A1. The Ocean Springs Record, "Residents speak out, but board takes no action", January 5, 2006, p. A1. The Ocean Springs Record, "Six-lane bridge only option, Brown says", January 12, 2006, p. A1. The Ocean Springs Record, "Aldermen take on bridge plan tonight", January 12, 2006, p. A1. The Ocean Springs Record, “City pursues temporary US 90 bridge”, February 9, 2006, p. A1. The Ocean Springs Record, "MDOT to rebid bridge”, March 9, 2006, p. A1. The Ocean Springs Record, "(Gene) Taylor touts safety factor of MDOT’s bridge plans”, May 18, 2006, p. A6. The Ocean Springs Record, “Signature’ bridge pushed’, August 3, 2006, p. A1. The Ocean Springs Record, “Brrr-bridge”, January 18, 2007, p. A1. The Ocean Springs Record, “Bridge work on schedule”, June 14, 2007, p. A1. The Ocean Springs Record, “City’s bridge party plans are under construction”, October 11, 2007, p. A1. The Ocean Springs Record, “Search for [Biloxi Bay Bridge celebration] money ends with success”, October 25, 2007, p. A1. The Ocean Springs Record, “Bridging the Gap”, Commemorative Section, October 25, 2007. The Ocean Springs Record, “Students celebrate bridge”, November 1, 2007, p. A1. The Ocean Springs Record, “Bridge party details announced”, November 1, 2007, p. A3. The Ocean Springs Record, “Postmark to commemorate bridge-opening milestone”, November 1, 2007, p. A3. The Ocean Springs Record, “Murals come to life”, October 30, 2008, p. A3. The Sun Herald, "Temporary ferry system under discussion", October 21, 2005, p. A10. The Sun Herald, "Bridge will have extras", November 3, 2005, p. A8. The Sun Herald, "Denyer: Megabridge not for O.S. ", November 16, 2005, p. A9. The Sun Herald, "History, future square off on design", December 1, 2005, p. A1. The Sun Herald, "'We can proceed' MDOT: Cities agree on bridge plan", December 7, 2005, p. A1. The Sun Herald, "Moran to oppose bridge in letter", December 7, 2005, p. A8. The Sun Herald, "MDOT's bridge plan backed", December 14, 2005, p. A16. The Sun Herald, "O.S. Mayor battles six-lane bridge, "December 23, 2005, p. A1. The Sun Herald, "Jackson County Supports 6 lanes, "December 29, 2005, p. A1. The Sun Herald, "He's (Wayne Brown) no poet, and he knows it, "December 29, 2005, p. A3. The Sun Herald, "Moran to meet about bridge", January 2, 2006, p. A2. The Sun Herald, "U.S. 90 bridge project still in limbo", January 4, 2006, p. A2. The Sun Herald, "Bridge design may not fly", January 4, 2006, p. A2. The Sun Herald, "Bridge proposals to be submitted today", January 13, 2006, p. A3. The Sun Herald, "Aldermen support six-lane bridge”, January 14, 2006, p. A1. The Sun Herald, "If you can’t raise the bridge”, January 19, 2006, p. A2. The Sun Herald, "Drawbridge or no? Be prepared for delay”, January 21, 2006, p. A1. The Sun Herald, “Bids on bridges come in high”, January 24, 2006, p. A1. The Sun Herald, “Threat or truth? ”, January 25, 2006, p. A1. The Sun Herald, “Lifespan ”, February 3, 2006, p. A1. The Sun Herald, “MDOT’s way or the highway, it seems? ”, February 3, 2006, p. A10. The Sun Herald, “Biloxi Bay bridge update”, February 3, 2006, p. A10. The Sun Herald, “MDOT ups the ante to 95 feet”, February 22, 2006, p. A1. The Sun Herald, “Bid may be let Tuesday…or not”, February 23, 2006, p. A1. The Sun Herald, “Bridge’s fate lies with feds, attorneys”, February 28, 2006, p. A2. The Sun Herald, “MDOT eases up on bridge”, March 29, 2006, p. A4. The Sun Herald, “Before and After [Katrina]-‘Biloxi Bay Bridge”, April 1, 2006, p. A8. The Sun Herald, “Paving the way”, April 8, 2006, p. A1. The Sun Herald, “MDOT cautious on ferries”, April 20, 2006, p. A2. The Sun Herald, “Biloxi Bay bridge coming”, May 16, 2006, p. A2. The Sun Herald, “MDOT gets three bridge bids”, May 27, 2006, p. A2. The Sun Herald, “K.C. firm wins bid on bridge”, June 6, 2006, p. A1. The Sun Herald, “Ferry service sinking”, June 7, 2006, p. A2. The Sun Herald, “Biloxi Bay bridge is on its way”, June 17, 2006, p. A3. The Sun Herald, “None of the above’ wins out on bridge”, July 27, 2006, p. A1. The Sun Herald, “Moran presses her case for nicer bridge", July 29, 2006, p. A1. The Sun Herald, "Moran, MDOT agree on pretty bridge", August 19, 2006, p. 3. The Sun Herald, "Ferry work project bids come in high”, September 12, 2006, p. A5. The Sun Herald, "MDOT set to let ferry contract”, September 20, 2006, p. A2. The Sun Herald, "Cost of convenience”, September 25, 2006, p. A1. The Sun Herald, "Ferry expected this afternoon”, October 31, 2006, p. A1. The Sun Herald, "Ferry to set sail”, November 1, 2006, p. A2. The Sun Herald, "Great day for a ferry ride”, November 2, 2006, p. A2. The Sun Herald, "Bridge coming along”, December 8, 2006, p. A2. The Sun Herald, "Bridge on schedule”, February 8, 2007, p. A1. The Sun Herald, "The missing link”, May 2, 2007, p. A1. The Sun Herald, "Going UP”, May 3, 2007, p. A1. The Sun Herald, "Commemorative Section”-‘Spanning history’, May 13, 2007, 15 pages. The Sun Herald, “Biloxi-O.S. to start planning bridge party”, June 4. 2007. p. A2. The Sun Herald, “MDOT planning bridge dedication”, June 6, 2007, p. A2. The Sun Herald, “One dead, one missing in bridge accident [Bay St. Louis]”, June 15, 2007. The Sun Herald, “Bridge work [Bay St. Louis]halts, probe begins”, June 16, 2007, p. A1. The Sun Herald, “Bridge work [Bay St. Louis] resumes today; names of injured not released”, June 19, 2007, p. A1. The Sun Herald, “Expect ‘celebration to remember’”, June 24, 2007, p. A1. The Sun Herald, “Bridge may be open early”, July 15, 2007, p. A1. The Sun Herald, “Bridge on schedule”, August 17, 2007, p. A2. The Sun Herald, “Lighting to delay Bay [Bay St. Louis] bridge”, October 2, 2007, p. A1. The Sun Herald, “Funding, logo for bridge fete OK’d”, October 10, 2007, p. A8. The Sun Herald, “Moran calls on history in logo defense”, October 11, 2007, p. A9. The Sun Herald, “Beam plunges off bridge into bay”, October 18, 2007, p. A1. The Sun Herald, “Let’s cross this bridge when we come to it”, October 21, 2007, p. F4. The Sun Herald, “Cause unknown for bridge beam fall”, October 22, 2007, p. A2. The Sun Herald, “New bridge is already ‘tagged’”, October 27, 2007, p. A3. The Sun Herald, “Political overtones for bridge opening”, October 28, 2007, p. A1. The Sun Herald, “Reconnected [Commemorative Section]”, October 28, 2007, p. A1. The Sun Herald, “Four days to go”, October 28, 2007, p. A1. The Sun Herald, “Biloxi Bay Bridge/Past and Present”, October 28, 2007, p. A7. The Sun Herald, “New bridge bends at both ends”, October 30, 2007, p. A1. The Sun Herald, “Bridge to open after day of parties”, October 31, 2007, p. A10. The Sun Herald, “Ocean Springs events”, October 31, 2007, p. A10. The Sun Herald, “Together again”, November 1, 2007, p. A1. The Sun Herald, “So much more than a bridge”, November 1, 2007, p. A1. The Sun Herald, “Bridge celebration highlights”, November 1, 2007, p. A1. The Sun Herald, “Official MDOT events”, November 1, 2007, p. A8. The Sun Herald, “Biloxi events”, November 1, 2007, p. A8. The Sun Herald, “Ocean Springs events”, November 1, 2007, p. A8. The Sun Herald, “Biloxi Bay Bridge is cause to celebrate”, November 1, 2007, p. C2. The Sun Herald, “Open for business”, November 2, 2007, p. A1. The Sun Herald, “Bridge Opening: Biloxi, November 2, 2007, p. A6. The Sun Herald, “The last missing link”, November 2, 2007, p. A6. The Sun Herald, “Bridge Opening: Ocean Springs, November 2, 2007, p. A7. The Sun Herald, “A day to celebrate the days ahead”, November 2, 2007, p. A7. The Ocean Springs Record, “Bridge in final phase, artists called”, February 28, 2008, p. A1. The Sun Herald, “Ocean Springs calls for submissions for bridge art”, February 25, 2008, p. A3. The Sun Herald, “Four artists’ work sought for bridge”, February 26, 2008, p. A3. The Sun Herald, “MDOT expects to open all lanes Monday”, April 3, 2008, p. A2. The Ocean Springs Record, “Officials to dedicate mosaic bridge panels”, April 30, 2009, p. 3. The Ocean Springs Record, “The Biloxi Bay Bridge and all things considered”, May 21, 2009, p. 3. The Sun Herald, “Mayoral hopefuls [Moran-Walker] debate bridge”, May 24, 2009, p. A1. The Sun Herald, “Symbol of unity shouldn’t divide Ocean Springs”, May 24, 2009, 2009, p. B2. The Sun Herald, “OS bans dogs from bridge”, September 17, 2009, p. A1. The Ocean Springs Gazette, “Dog ban on bridge spurs comments”, September 24, 2009, p. 16.